Cookies: something that the Americans do exceedingly well. The British have to concede victory to the Americans on the cookie front! 1. Pre-heat the oven to 160˚C. 2. Lightly grease a baking tray with some unsalted butter. 3. In a large mixing bowl whisk the butter and sugar together until smooth. 4. Add the condensed milk and continue whisking. 5. Add the flour, baking powder and vanilla and mix it all with a spoon. 6. Add the chocolate chips and pecans and mix them in with a spoon. 7. Roll the dough into a sausage shape (about 7 inches long), and chill it in a freezer for 10 minutes (or in a fridge for an hour). 8. Cut the dough into ½ inch thick round slices and space well on the greased baking tray (they double in size), and bake for 13 minutes if you want them chewy, or 14 minutes if you want them crisp. You could use hazelnut butter or another nut butter instead of pecan nuts, (but make sure there isn’t sugar in the nut butter or else the cookies will turn out too sweet). I use macadamia butter because macadamia nuts have the best omega 6 to omega 3 ratio (they are 1:1, whereas most other nuts are 6:1 or worse). It’s your choice as to whether you use milk chocolate or dark chocolate chips, but do try and use good quality chocolate in either case. 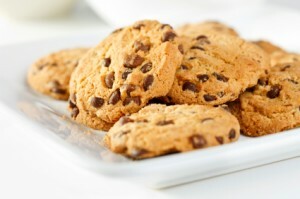 If you prefer cookies without nuts, then add an extra 75g of flour instead of the nuts. You can also make the dough ahead and keep it in the fridge for a couple of days and then bake them whenever you want.